This is Hennepin Avenue at 10th Street, viewed from a skyway over Hennepin. 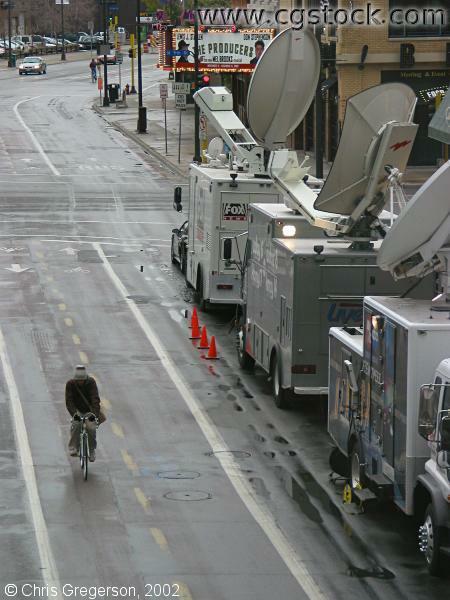 The trucks on the right are satellite news vehicles that are here for a Democratic leadership meeting at the State Theater (across the street and out of frame). The meeting will announce the selection of Walter Mondale as the DFL candidate for Senator, replacing the late Senator Paul Wellstone. The marquee for the Orpheum Theater is in the upper background.